A youthful Ireland women's side drew 1-1 in Sunday's opening game in a three-Test series against Scotland. Graham Shaw gave debuts to teenagers Sarah Torrans and Hannah McLoughlin as his side had 10 changes from their last game at the European Championships. 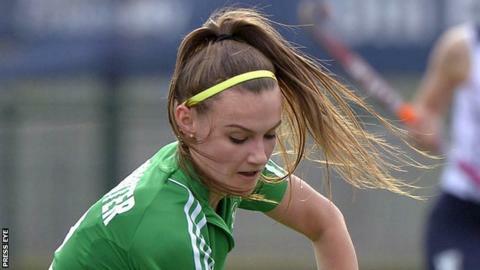 Jessica McMaster's eighth-minute goal levelled at Stormont after Charlotte Watson had put Scotland ahead. "We've got to look at the World Cup but we also have to look even further," said Ireland coach Shaw. "All in all, we are quite happy. We tried a few different things, a few different shapes, different people in new positions. "We have to make sure we have a squad full of different generations. "We need to give the younger players, give them the opportunity and see if we can make a really competitive squad." As for the debutantes specifically, Shaw added: "Hannah showed a lot of composure. She has a good physical presence and is calm on the ball. "Sarah was a real constant threat up there. When you have that speed, it's really exciting to see her use it. "We feel her skill-set and the physicality she has is so suited to international hockey." The two sides meet again on Tuesday at Banbridge at 19:00 BST before returning to Stormont on Wednesday at 12:30.